n a slaughterhouse in Macdoel, a speck of a town in Siskiyou County, just south of the Oregon border, seven workers step around each other and four cow carcasses on the kill floor, their movements almost a dance. Prather Ranch co-owner Mary Rickert explains the process. “Just on the other side of that panel, the animal’s knocked unconscious," she says. "The throats are slit, they have to be bled out. Then they’re laid on this cradle,” where they're skinned. Workers remove the animal's organs and spinal cord, then cut the carcass in half with a saw. That’s where Emily Rosecrans, sporting brightly painted nails, takes over. She trims off imperfections from the carcass. “I look for hair, feces, bruises, pretty much anything I wouldn’t want to eat,” she says. She then moves the carcass into a cooler. Mary’s husband, Jim Rickert, works away from the main action. "I’m boning out the cow head," he explains. “You kind of have to know how an animal is put together so you can take it apart." He puts all the meat he says he wouldn’t feed to his grandchildren on one tray — that’ll be sold as pet food — and the really good stuff goes on another tray. "There’s a nice beef cheek right there,” he says. “It goes down to a restaurant in San Francisco, and as I recall they sell a dinner there, a beef cheek dinner, and for $75. I’ve never been able to afford one, but that’s what I hear." Aside from food sales, Prather Ranch will also sell parts of these animals to companies in the biomedical field. The hides, for example, go to make a purified collagen solution used in cell research. And bones? Some have been made into screws for things like knee surgery. 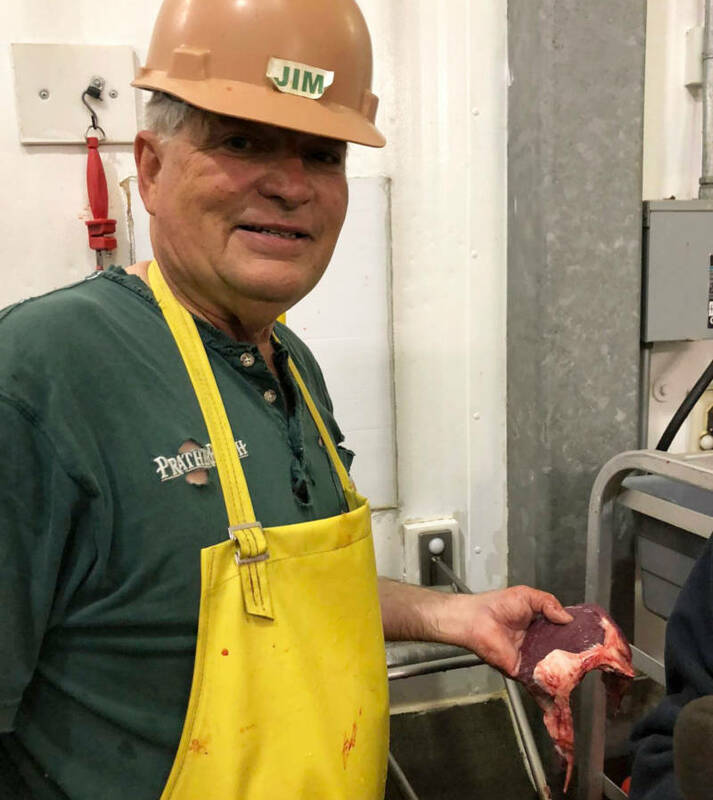 “Cow bones are real popular,” says Jim Rickert. “There’s one company that takes all this stuff for dental work,” grinding bones up for fillings. Another company is researching ways to replace parts of human bones. They’re using Prather Ranch cow bones, which have been 3D-printed with human cells. “Pretty strange science, but really fascinating,” says Jim Rickert. “And we like doing our part of it. If we’re gonna take the animal’s life, I believe we have the moral obligation to utilize the animal as much as possible. First it’s good business; but it’s good morals." Companies come to Prather Ranch for a variety of bovine parts, Mary Rickert says. "We've done all the way from pituitary glands to eyeballs to uteri to pericardium." In some ways, this is nothing new. Indigenous people around the world have used plants and whole animals for medicine as well as food. Jim Rickert says that in Western medicine, “There’s clear evidence of people using bones from pigs clear back to the 1700s,” though not very successfully. 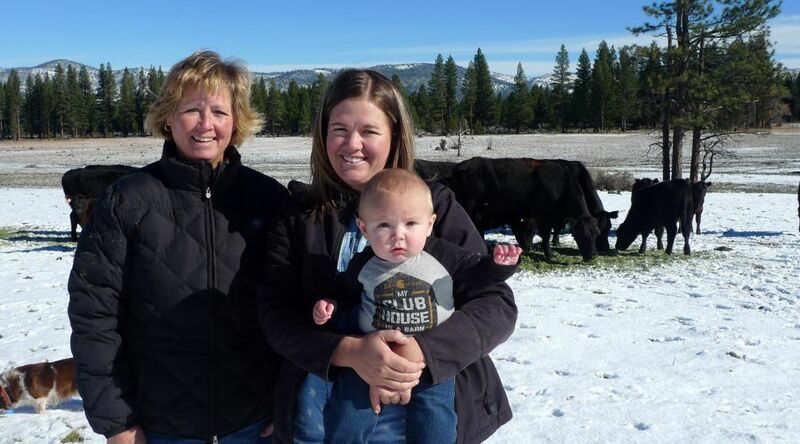 The Rickerts met and fell in love at Cal Poly-San Luis Obispo, and within a decade, they came up to Prather Ranch to manage the operation. They faced a money-losing business, and had to get creative, Jim explains. "I shrunk the herd down to about 250 mother cows. We just didn’t buy replacement females," he says. That created what’s now known as a “closed herd.” All animals in the herd are born within it; no new ones are introduced. That decision changed everything. Because, at the same time, in the early 1990s, two things were happening that, on the surface, seem to have nothing to do with each other. The first was an animal health scare. Mad cow disease — more formally known as bovine spongiform encephalopathy — "was really developing into a real serious health crisis in the United Kingdom and Europe,” Mary says. The second? A beauty trend: dermal fillers. Remember the pillowy lips of actresses in the 1990s? That look came from collagen injections that came from cowhides. 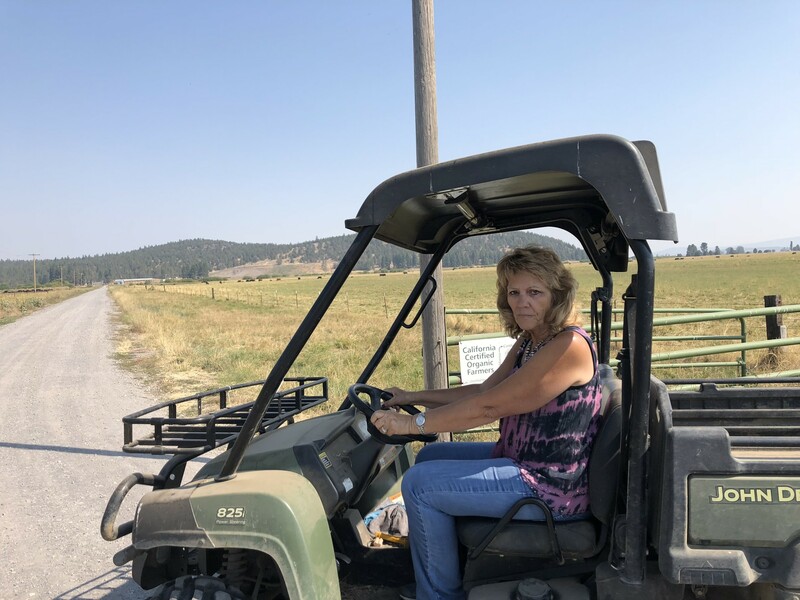 Jim says an old friend, an early pioneer in collagen dermal fillers, knew that Prather Ranch had a closed herd, which made it much less susceptible to problems like mad cow disease. He knew he could make a cleaner, safer collagen with their cowhides. So he called them up. “And I remember going, 'Really?' ” Jim says with a laugh. "Puffy lips wasn’t exactly our primary life goal at that point,” Mary adds. But the Rickerts wanted to keep the ranch going. That collagen company built them the slaughterhouse on-site. Eventually, biomedical companies came knocking for cow parts, too. He won’t talk about the financials, but Jim says there have been years when they’ve made more money selling beef byproducts for medical use than they made selling beef. The companies that buy from Prather Ranch sign confidentiality agreements, but one executive — whose company turns Prather Ranch cowhides into purified collagen for cell research, cancer research and 3D bio printing — says that a hide from Prather Ranch can cost him thousands of dollars more than those from other sources. In the processing room, employee Craig Holbrook preps a femur bone for a medical client. 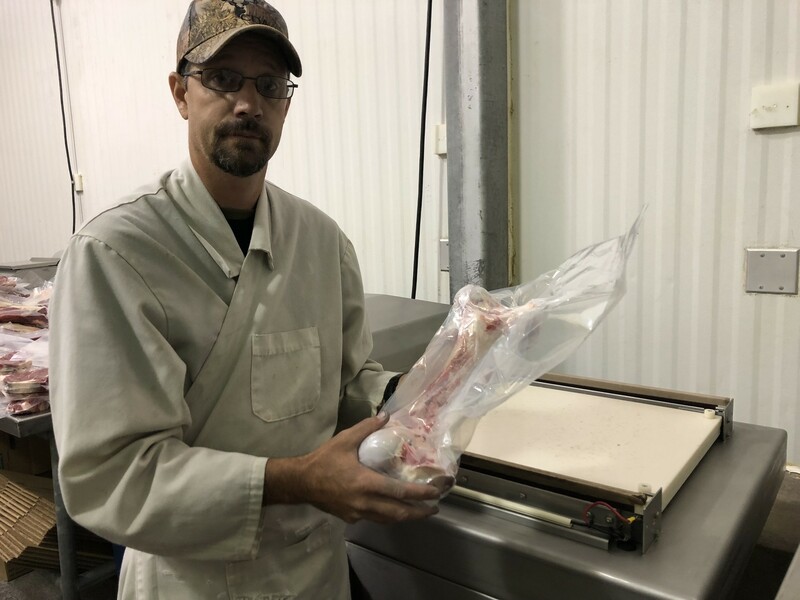 He saws the bone, double-bags it in plastic, then sends it through a vacuum sealer. Packages like this are then sent via FedEx to customers across the country. One result of meeting all the FDA standards to sell the parts to medical companies? 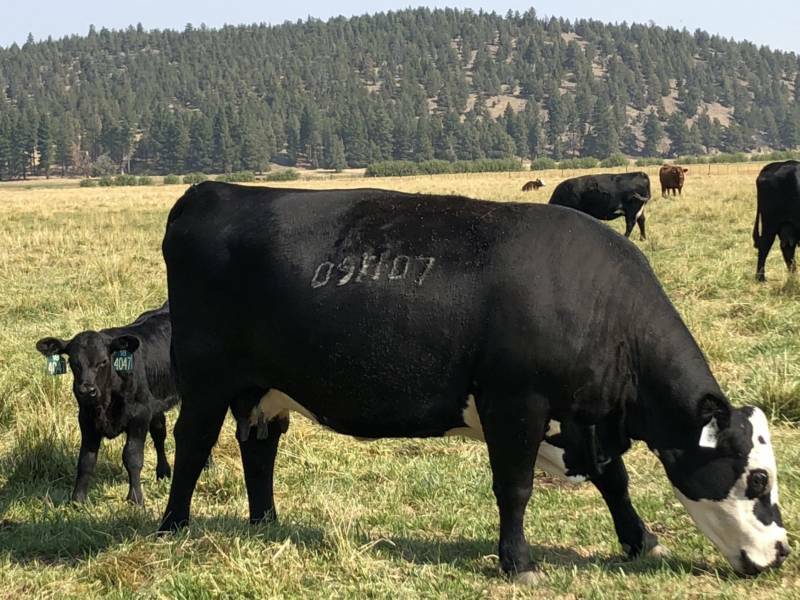 The Rickerts set themselves up to produce really high-quality beef. Mary says they do DNA testing on bulls specifically for genes that increase the likelihood of marbling and tenderness in the beef. It’s a sought-after quality, and pretty expensive. Mary also says she and her husband share a core belief: that they should handle animals gently until the very last minute. At the "knock box," where cows get knocked out by a stun gun before being moved to the kill floor, she points out a quote by animal behaviorist Temple Grandin, who advocates for humane slaughter of livestock. She says she wants everyone at the slaughterhouse to think about that. This piece was produced in collaboration with the Food & Environment Reporting Network, a nonprofit investigative news organization.